Millions of people wear contact lenses, but they don’t suit everyone’s lifestyle and there are disadvantages of wearing contact lenses them long term. Manufacture of contact lenses first started in the nineteenth century, but the lenses were made of glass. 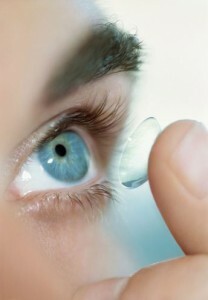 It wasn’t until 1939 when the first plastic contact lenses appeared; and flexible lenses weren’t introduced until 1971. Since then, the optical industry has made a lot of progress, but the fact remains that they can be an inconvenience and have long term effects if not used correctly. During the past 50 years, millions of contact lens wearers have been satisfied with their reliability with only a small percentage having had any difficulty in wearing them. However, even if problems are rare, they can become serious. Almost all complications are due to poor hygiene and contact lens maintenance. People who wear lenses often don’t clean or disinfect them according to their optician’s advice, or do not have recommended annual eye checks. Are You Fed Up Cleaning Your Contact Lenses? If you are fed up with cleaning your lenses, or find them an irritation, find out how laser eye surgery can transform your life here . We offer other vision correction treatments including implantable contact lens’ and lens replacement treatment that could be for you. Alternatively, you can contact AVC today on 020 7935 7497 or email info@advancedvisioncare.co.uk where our expert advisors are ready to answer your questions and to help guide you the through the process.